It’s time to tackle the wet weather in style! While we have an array of boots in our closets already, they are no match for mother nature. As much as we love to shop, it always pains Us to replace a stylish design ruined from rain or snow. So, it’s only right that we invest in a pair that will keep our feet nice and dry. We’re looking for an offering that’s equal parts fashionable and durable enough to withstand anything the weather throws our way. So, once we set our sights on these water-resistant booties, we were totally smitten! Who’s ready to Shop With Us? 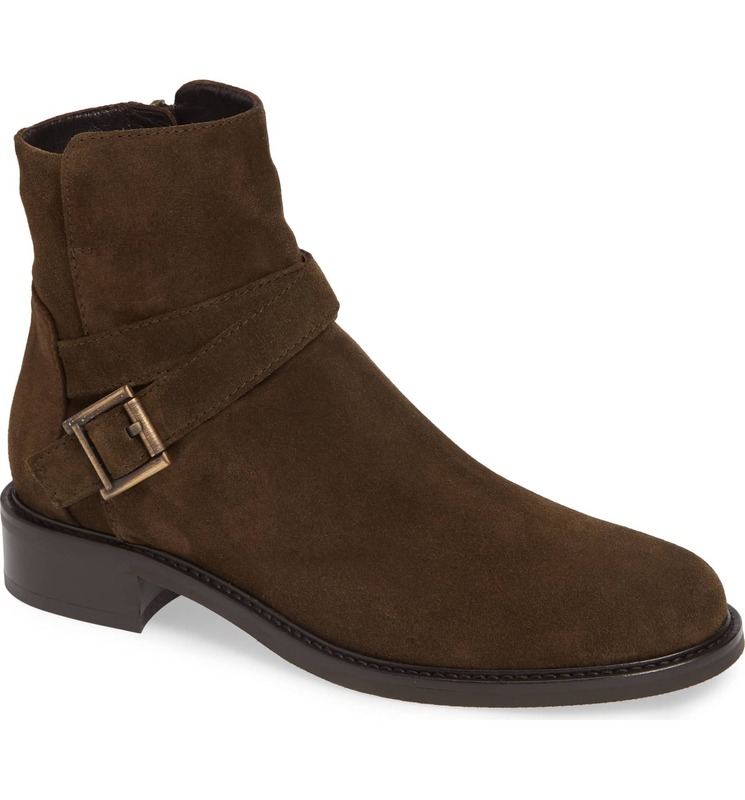 See It: Grab the Aquatalia Bree Water Resistant Bootie at Nordstrom for 50 percent off the original price of $325, now $163 in black tumbled calf, chestnut suede and olive suede while it’s still in stock. The Aquatalia Bree Water Resistant Bootie is made with genuine leather, so this style offers top quality any shoe lover will love. Designed with Aquatalia’s signature water-resistant treatment, this style won’t be ruined by inclement conditions. From slushy snow to thunderstorms, we can count on this construction to go the distance. Equipped with an almost 2-inch stacked block heel, we love that we can elongate our legs without the pain of traditional heels. Sore feet are officially a thing of the past! There are also crisscrossed straps and a roller buckle that gives this pair an edgy, yet rugged look. Complete with a side-zip closure and a grippy rubber sole for extra traction, we can feel confident walking on various surfaces with sturdy wear. An undeniable essential for every fashionista, we’ll be able to take on the wet weather without fear. Whether we’re heading to the office or hanging out with girlfriends, these boots will keep our look pretty and polished. We can’t stop fawning over the olive suede style. A gorgeous hue that provides Us with a pretty neutral we can wear again and again, we already have a few ensembles in mind. 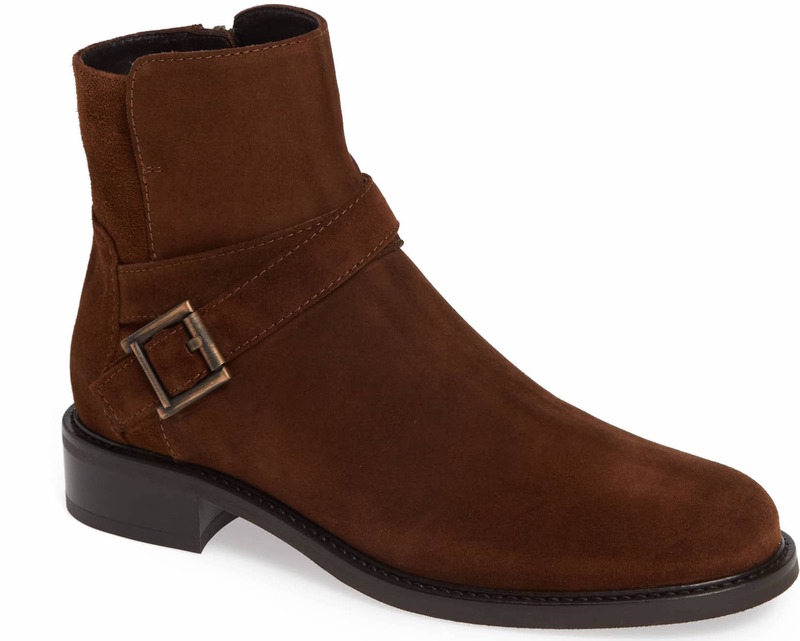 There is also the chestnut suede offering that provides a rich brown finish that’s perfect for our year-round style. For those who always stay true to classic hues, the black tumbled calf style is a great buy. Versatile, chic and everything you would need in a water-resistant creation, this design makes it easy to pair with our wardrobe. Best of all, this stunning construction has hit the Nordstrom sale section! Yes, you read that correctly! We can shop this essential at a 50 percent off markdown, leaving Us with a $163 price tag. This is amazing news for our closet and wallet! 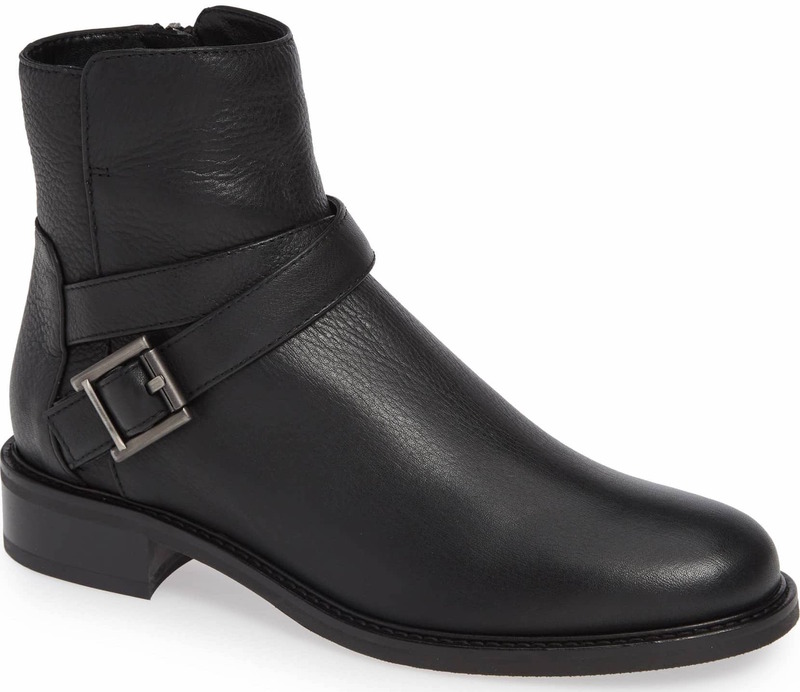 We can think of a variety of ways to wear these booties and we plan on pairing with black skinny jeans, a turtleneck a moto leather jacket and a cross-body bag to channel our inner biker babe. For days when we’re heading to the office, we can pull out a midiskirt, a buttondown top, a boyfriend vest, a top coat and a tote bag to rule the boardroom in style. We can even take our style up a notch with peg trousers, a bodysuit, suede jacket and a shoulder bag to hit happy hour with our girlfriends. Thinking of a relaxed look to run errands in? We’re wearing high-waist leggings, a long sleeve tee and a midi coat for all-day comfort. From day to night, this style will always come in handy for all of our looks. Nordstrom shoppers are equally impressed! Many reviewers love that these booties are very comfy with great arch support, while others like the top-quality craftsmanship and stylish appeal. Shoppers also dig that this style requires no break-in time, while others like that they can be dressed up or down with ease. One reviewer shared that this pair is quite fashionable for being waterproof and we agree! Many reviewers also love the timeless style and comfy padding on the inside, while others appreciate that they keep your feet dry all day long. One shopper even noted that these are the most comfortable booties they have ever owned. Praised for its amazing durability and lightweight feel, we have already made space in our closet. Sizes 5 to 11 are available in select styles. An absolute must-have for any fashionista, it’s no surprise that this offering is flying off the shelves. A timeless design that can be worn throughout all the seasons, this is a style we can’t pass up.